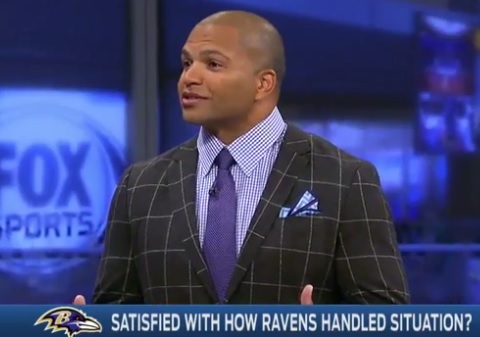 While some of the focus during The Ray Rice Dumpster Fire has been on ESPN’s Ray Lewis digging himself a deeper and deeper hole, there’s another former Ravens player that works for a network that’s doing a decent enough job – Brendan Ayanbadejo. The former Baltimore linebacker and special teams ace still didn’t give a perfect response, but given his closeness to the organization and the relevant people in this mess, he did the best he reasonably could have. What I found most interesting was Ayanbadejo tearing down Lewis’ comments (in the most polite way possible). Ray Lewis’ stock as an analyst has gone into the toilet over the year-plus he’s been on the job, and I think Ayanbadejo’s performance here can help us understand why. He was blunt, honest, and while he did show some favor towards his former organization, it didn’t cloud his larger point and come off as insincere. In his tenure at Fox Sports 1, Ayanbadejo has been a thoughtful voice covering the NFL and when it comes to his former team, that’s no exception. He’s everything Ray Lewis isn’t as a television analyst, and that’s a good thing.